This morning, I walked outside my front door at 6:45 a.m. with my coffee in hand and was pleased to hear a Great Crested Flycatcher calling out nearby. I sat down on my steps and listened, sipping while scanning the tree branches around me. Suddenly I spotted her moving in the highest branches of the camphor tree across the street. When she landed on a bare branch directly in front of me, as if to invite me to take a look, I finally grabbed my binoculars from just inside the front door. Catching her in the viewfinder, I followed her for a few minutes while she darted about. I saw a flash of her lemon yellow belly as she flew over me and then a clear view of her, the light directly on her, perching on the oak tree next door, cocking her head, looking at me. The robins are coming to life. The loose flocks lurking around the neighborhood are now moving in, feasting on the red holly berries that just turned the proper degree of ripeness after January’s crisp nights. The activity in the backyard this morning caught my eye as the robins darted from pine to holly and then back again, like trapeze artists in a circus performance. A plump, speckled one suddenly landed on the fence, eyeing me as I came out the back door for a closer look. She contemplated me, pausing for a moment in the work of her life: to pluck ripe berries before making her way up North for nest-building time. It’s a natural process that can’t be stopped; a force of nature that can’t avoided. “You better be ready for a growth stage,” she seemed to say, eyeing me steadily. I’m a bit surprised to find that I am. As I look at the photos of the new house I covet—a cute cottage, just the right size, in just the right neighborhood—I realize I’m actually looking forward to change. I’m not holding on to this place. The bright red door of possibility is as warm and welcoming as the robin’s breast. It’s true that change is inevitable, like the turn of the seasons, like the robins’ need to eat and migrate, like the balmy spring that will follow the frozen winter of my heart. Spring is my favorite season, after all. Perhaps I can tuck its blooms into my own red breast and get ready to migrate to my new home. I just peeped outside the front door, through the leaded glass panes, and saw a thin bank of mist out there. Reminds me of the mist on the farm where I grew up, hanging low in the valley around the house and barn early in the morning. Mist makes the world mysterious, briefly transforming it into something special — and then it’s gone again, a small gift only for early risers. Through the back door I see a female cardinal at a feeder that’s been empty all summer. 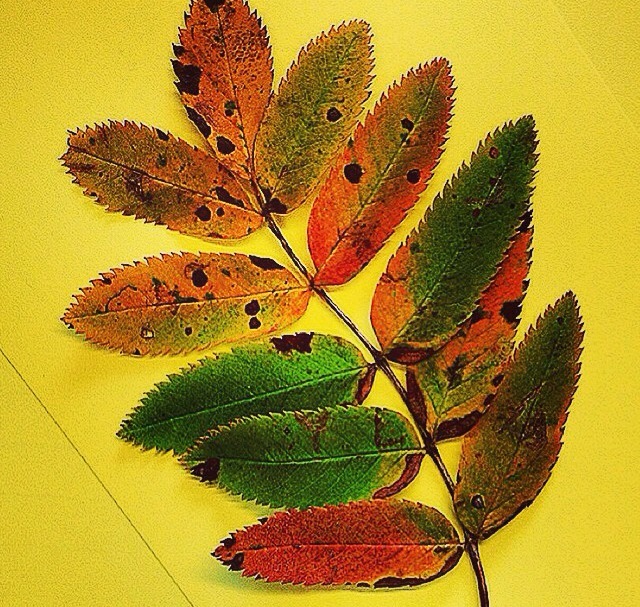 The season is changing, and plants and animals are in a different relationship with each other. Perhaps the birds are starting to stock up again on my bird seed, prepping for winter. Fall mornings these days include me urging Matthew out the door on time for school — which didn’t work out today. It also includes walking the dog, perhaps with a slight coolness in the air, looking about us as we go, searching for signs of the turning season. Or is it me that’s turning, entering the fall season of MY life? The thought lingers, like a thin mist, lying low in my garden. Or maybe not quite yet. I decided to go on a quest for a summer tanager today. I’m having a “staycation” while the kids are out of town, so, outdoor adventures close to home are in order. 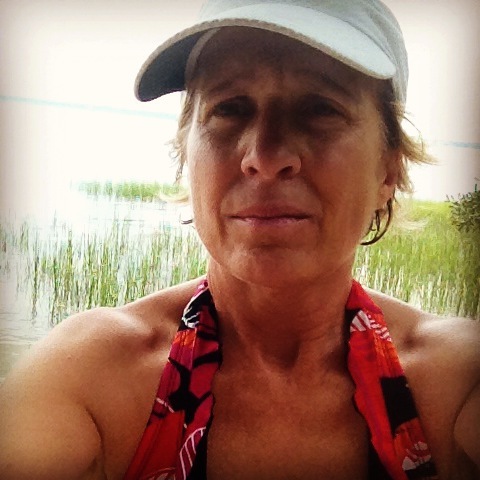 On last week’s adventure, I ran through Guana Reserve, where I spotted “giant garden spiders, an armadillo, two white-tailed deer, a raccoon in the trees I walked under, a hawk nest, a white cloud butterfly, a swallowtail butterfly, an impassable flooded trail, snakes in the grass, ticks, fiddler crabs, leaping frogs, lizards, birds, and that was enough,” as I noted on Instagram. This week, I hit the Guana Wildlife Preserve, where my new photographer friend Don Christian said I might spot the tanagers. “Just head for the oaks and keep looking up in the trees!” he said. I was thrilled to hear that I might be able to see these mysterious creatures! I am in love with tanagers. Last summer I happened upon several scarlet tanagers in the mature woods of the Laurel Mountains in Pennsylvania. I was practically euphoric. My son, Matthew, and I have had summer tanagers on our “watch list” for a few years now, but, I never knew where to find them. So, I packed a lunch of peanut butter and jelly, scribbled the directions in my journal, stocked up with water, two cameras, natural bug repellant (I HATE that stuff but this was necessary! ), my phone, and a song in my heart. So, this is what “following your bliss” feels like, eh? But first, the run. I planned to combine bird-watching AND running the trails. (p.s. this is not really good for spotting birds). I figured I would run first, THEN come back with the camera. Well, it wasn’t great for bird-watching per se, but, I did get to see lots of other things: beautiful Florida oak groves, many swallowtails, fiddler crabs, and lots and lots and LOTS of flies, mosquitos and horseflies. But hey — no ticks! (So far, anyway). Cool lizard with lunch in his mouth. Once again, as I got to the outer reaches, and took a wrong turn, and ended up further away than I thought, I did say to myself, Hmmm…why DO I have to do everything so hard? As I turned into a grassy section, the signs said the trails sometimes flood. Did that stop me? Oh, no. I just went deeper and deeper in the woods. I was on a quest, you see. Well, eventually, the flooding did stop me, so, I had to turn around. 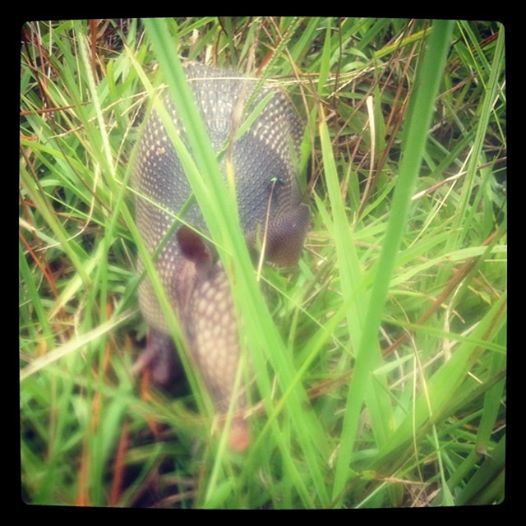 But that’s when I bumped into the baby armadillo! Such a cutie! He was hunched up in the grass, as if he was thinking, “Hey, if I cover my head, maybe she won’t see me!” But I sure did, and stopped running long enough to take out my phone and snap a shot — even though the lens was steamed up. I got super close and he untucked his head and looked up at me, with his cute little pink ears and sweet face. I smiled and kept going. Baby armadillo through my steamed up iPhone lens! Finally, I reached the parking lot again, and took out my camera for the “bird watch” part. I thought I had heard an Eastern towhee in the pine section, but I couldn’t tell for sure. Needed the telescope lens of the camera. 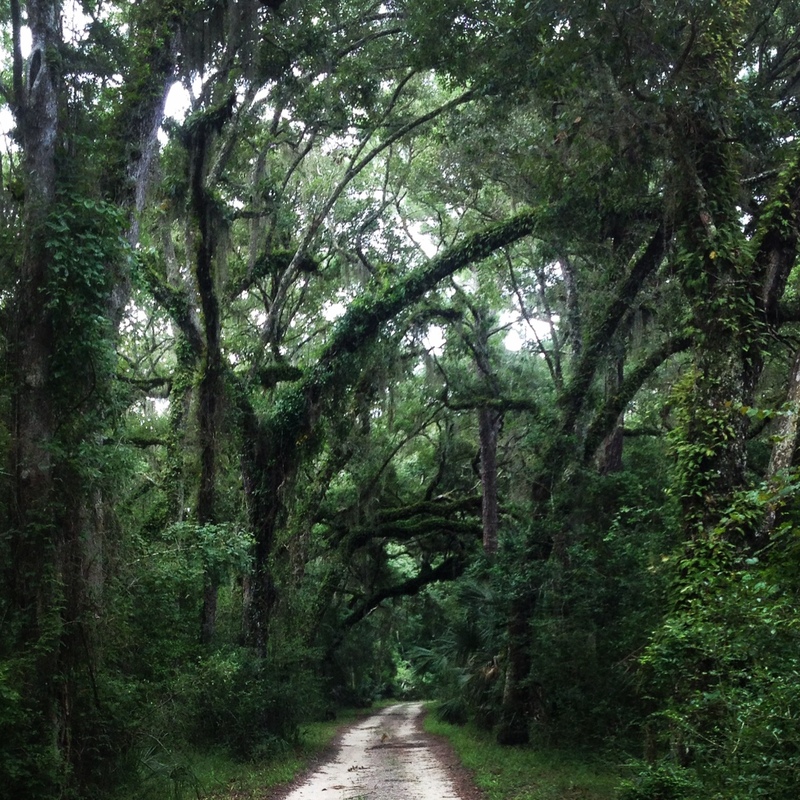 So, very quietly, with a LOT more bug spray on me, I headed down the trails. 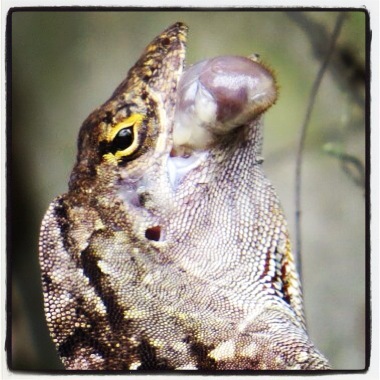 I saw a weird lizard with something in it’s mouth, which I now realize was a bug he just ate. Ewww! 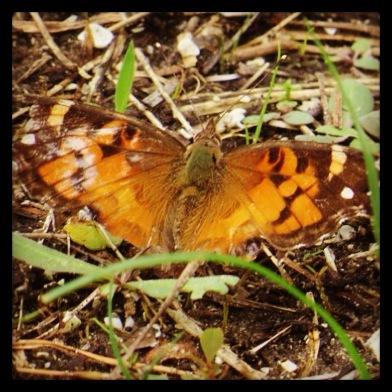 I saw a delightful blue bee, a green dragonfly, wildflowers, a painted lady butterfly, and a lovely brown moth. I spotted a baby cardinal, sitting shyly behind a branch. I heard bullfrogs. 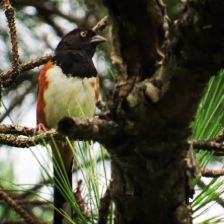 And I spotted something high up in the trees…yessss…it was…an Eastern towhee! Spotted an Eastern Towhee, even though he was not singing the exact same “drink your tea” as recorded on my birdsong CD…maybe a Florida version? OK, not a tanager. BUT, this was the first towhee I ever located on my own, and was able to photograph! So, that was plenty exciting for me. So now, I guess I just have to go back, and see if I can get the tanager. I’ll keep listening to Stan Tekiela’s CDs on “Birds Of Florida,” to try to recognize the tanager song. But I’ve got one more bird to check off my Life List, and I’m plenty happy with that.